A delicious starter, perfect for any time of year. It may be difficult to measure the amount of melons required as you will be using a melon baller to scoop them out. Place the natural yoghurt into a large mixing bowl. Whisk in honey and the grated orange zest and mix well until combined. Using a melon baller (parisienne scoop), scoop out melon balls and place in a large mixing bowl. Carefully segment the oranges and place them in a separate bowl. On a large serving platter neatly arrange the orange segments in a circle in the middle of a serving platter. Arrange melon balls into the middle of the circle of oranges on the plate. 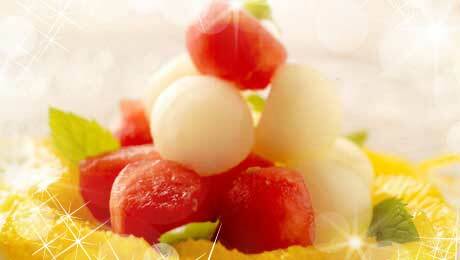 Sparingly sprinkle a little mint over the melon. Drizzle the dressing around the side of the plate and serve.